One of our long term goals for international travel has been Australia. When we were discussing our ideas for travel after retirement Australia was definitely on the list. We finally decided on Europe and left Australia for another day. Well, that day is back on the planning horizon. Talking to Skip and Rachel has gotten us all excited again about Australia. But that will be its own web pages when it happens. This story is about our run up to Mt. St. Helens. Mt. St. Helens is the volcano in our backyard (about 50 miles, 80 kilometers away to the northeast) that erupted in 1980 with a huge explosion out of its north side. It killed about 50 people including campers, residents, loggers and scientists studying the mountain. The mountain had been making noises for quite a while and was being heavily studied. That it would erupt was no surprise, just the moment that it happened was. Skip and Rachel were only able to spend one night with us and then it was off to a commitment in Olympia, our state capital and about 2 hours north of us. Because it would be a short riding day I took them up to the mountain on their way to Olympia. Kathy had some chores she wished to finish so she did not come along. We left the house about 10:00 on a beautiful sunny day and headed north for one hour on the I-5 freeway. Not fun but necessary. Then we turned off onto the two-lane highway that leads east to the viewpoint nearly 50 miles and another hour away. This is a scenic road in excellent condition. After the mountain settled down the federal government spent nearly 300 million dollars to build this dead end road. It curves up the valleys and along the hillsides until it reaches the end at the Johnston Ridge Viewpoint. There are a very limited number of pictures to choose from. Kathy normally takes all the riding pictures. This time I am trying to drive the motorcycle, stay on the road, hold the camera (without dropping it), look in the viewfinder and press the shutter button. This was the best of the bunch. You will notice that Rachel is taking a picture at the same time as I am. Along the way we stopped at a couple of other viewpoints but the best view is from the last one. Johnston Ridge has a view right into the north facing crater. You can wander around the patio for free but the visitors center is $8 USD (but free for senior Access cardholders and their friends) and has a large number of displays and a movie about the mountain, its blast zone and the recovery of the vegetation and wildlife in the 31 years since it erupted. Although it still does a little rumbling deep in its belly now and then and there is a lava dome slowly building in the center of the crater, the experts say that another eruption in our lifetime is unlikely. 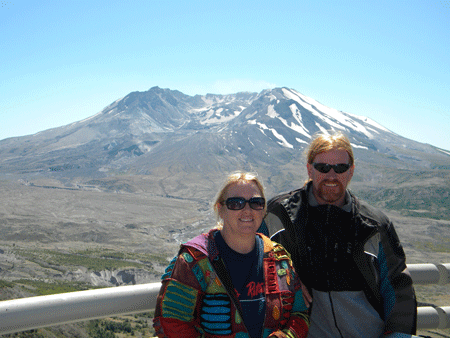 It previous eruption to 1980 was in the 1400's. After lunch at the hot dog stand in the parking lot we headed back down and parted ways. 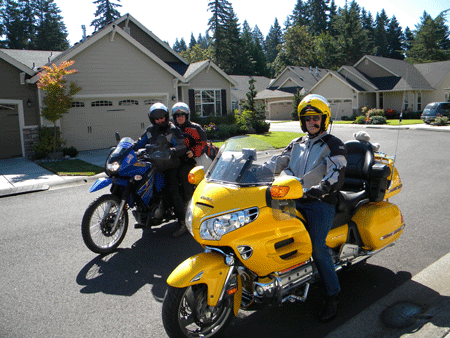 I went south toward home and they headed north to Olympia and on to the Canada West rally of Horizon's Unlimited, where they were going to make a presentation to the other travelling motorcyclists attending it. Kathy and I have been to four of their rallies (two-Canada West, one-California, one-Morocco) and have done a presentation at three of them. 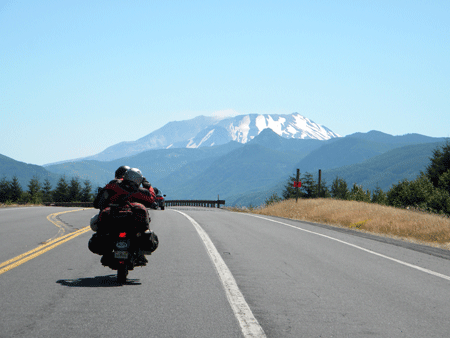 If you like to travel by motorcycle you will enjoy any of these rallies that may be near you. They are informative and fun. As we parted I told Skip and Rachel that I was going to follow the best advice that Grant Johnson (co-founder with his wife of Horizon's Unlimited) ever gave us. He said, "Set a date. Without a date you cannot do the preplanning that is necessary. If you keep saying 'Someday I want to ....', then you never will." So, as we parted I told Skip and Rachel that I was setting the date; July, 2013! We are looking forward to seeing them again then, if not sooner. Until then, Ride Safe! 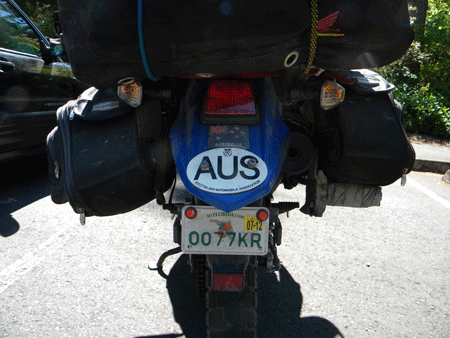 Someday I will post a planning page for Australia, maybe the summer of 2012 (winter in OZ).